But they’re not there yet. There is one pesky hurdle to overcome and, oddly, although it’s a low one, it’s not low enough…and may be the toughest to surmount. And that’s because, for live television, latency is a major issue. You can get away with a certain amount of latency in a sub-4K world. It’s done every day by simply introducing a certain amount of audio delay. Broadcasters can cope with that, but it still makes wireless HD and especially 4K UHD over RF a significant challenge. Sure. It can and is being done, but it still requires a trade-off, and it’s a fairly major one. Viewers, particularly the exploding demographic of those taking advantage of streaming services, are turning away from the annoyance of buffering, delays, and poor quality, all of which are largely down to latency issues. The current consensus is that the lowest latency that can be consistently achieved is around 100ms. As I said, broadcasters can deal with that without too much of a problem. But to my knowledge no one has really hit the mark to get the delay down to where it’s truly usable for everyday live action. One company claims to have achieved 75ms, but in order to get it down that far, further compromises have to be made. A lot of picture information has to be thrown out, and in my view, that’s “too much information”. The throw out factor – for want of a better term - is usually down to the encoding. To speed up encoding, you have to sacrifice quality, which for live action at higher resolutions is unacceptable, as is the inherent delay. I’ve experimented with the wireless transmitter options on offer to date. They all use the same chipset. Early versions had a delay of more than 1.2 seconds, which is not particularly useful for anything other than, for example, beauty shots from a helicopter that can just be cut into a programme. In applications such as that it works well and delivers acceptable pictures, but it’s not far off what you could already do with older SD radio cameras. In terms of cutting in live shots, the delay can be slightly noticeable but only if you’re a professional deliberately looking for it. But in higher resolutions it’s just not good enough. 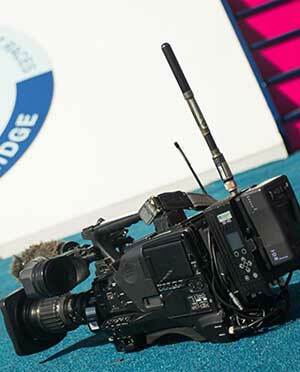 One UK broadcaster did a test at a professional football ground with original chipset encoders. On a monitor we watched a footballer strike a ball, then suddenly saw the ball careening toward the opposite goal - and nothing in between, not even the pitch. That’s clearly too much delay, even for a novice. New techniques, improved chipsets, and clever encoding algorithms will no doubt continue to reduce latency. There are limits to what existing chipsets can handle, but newer chipsets are always being developed, although perhaps not as rapidly as in the recent past. RF equipment manufacturers and, for that matter, hire companies, are always pushing for those encoding and latency improvements, but to achieve those goals, the conundrum of sacrificing information and, therefore, quality, for speed still remains. It just comes down to what individual manufacturers can come up with in their codecs, and what portions of emerging professional standards they choose to embrace or discard. Another question is, I suppose, somewhat subjective. At what point do viewers notice the delay or quality drop? Does ultra-high quality matter? And which judges are more important? The 60 or so people in a truck or studio, or the 60 million sitting at home, on a train, on a bus – pretty much anywhere these days? Where do you draw the line? What, in the end, is the low-latency limit? Before I get too hypothetical, let’s take a step back and get practical for a moment. Basically, I think the quality versus speed question is almost moot when it comes to UHD 4K, at least at the moment. When I talk to various customers today, what they want in wireless RF has nothing to do with 4K, progressive video, or anything like that. What they want more than anything are creative options. Some broadcasters argue that quality has to adhere to the highest accepted standards of established broadcasters, then quite happily settle for less, sometimes without even realising it. I’ve seen entire programmes broadcast that originated from camera feeds several MBs below a minimum acceptable standard, and no one knew the difference. So, if few, if any, notice the difference, is a push for lower latency by sacrificing quality worth pursuing? As I said earlier, consumers are becoming more savvy, and decidedly less tolerant. If they don’t like the channel or platform they’re using due to poor quality or incessant delays, they simply go to one of thousands of other options. Yes, they may not get the content they were seeking, but chances are they’ll find something else that interests them just as much, if not more. Another pair of eyeballs lost, quite often for good. So it’s in everyone’s interests to chase the low-latency/high quality dragon – as long as it makes sense to pursue it. Improvements will no doubt arrive in a combination of improved chipsets, advanced codecs, and new standards in due course, but I would posit that once you get to a certain level, you’re sawing sawdust. Miniaturisation, on the other hand - already pretty well-established and improving all the time – is what really hits the sweet spot with cameramen and producers, so long as acceptable quality can be maintained. As I said earlier, they want creative options, and reliable, miniaturised transmitters give them exactly that, and more. The ability to attach a camera transmitter to a helmet, hat, chest, or even strapped to the back of an eagle or whale opens up brave new worlds. A 4K transmitter, in and of itself, is not necessarily a selling point. Users are far more interested in something that’s compact, reliable, and with the lowest latency possible, so they take viewers places they’ve never been before. So, lower latency with improved miniaturisation is a winning combination that is already delivering exciting new options for HD productions. When it becomes viable for live 4K UHD productions, who knows what we might see next. But for now, it’s more about where you’re going than what it’s going to look like when you get there. However, if you can couple ultra-low, unnoticeable latency with high quality, that’s the Holy Grail, and it’s what will make the journey worthwhile. We’re just not there, yet.